THANK YOU to all who have contributed so far!! Please support the legislative advocacy work of the Association by contributing to the Friends of Florida Libraries Honor Roll. Advocacy efforts by the Florida Library Association include leading the fight for State Aid to Libraries funding for public libraries and intervening in a 2009 lawsuit to support the requirement that library directors be full-time employees. FLA's advocacy includes support for school, college and university libraries as well a multitype library cooperatives and the State Library and Archives. Please consider making a donation. Thank you for your support of Florida libraries! 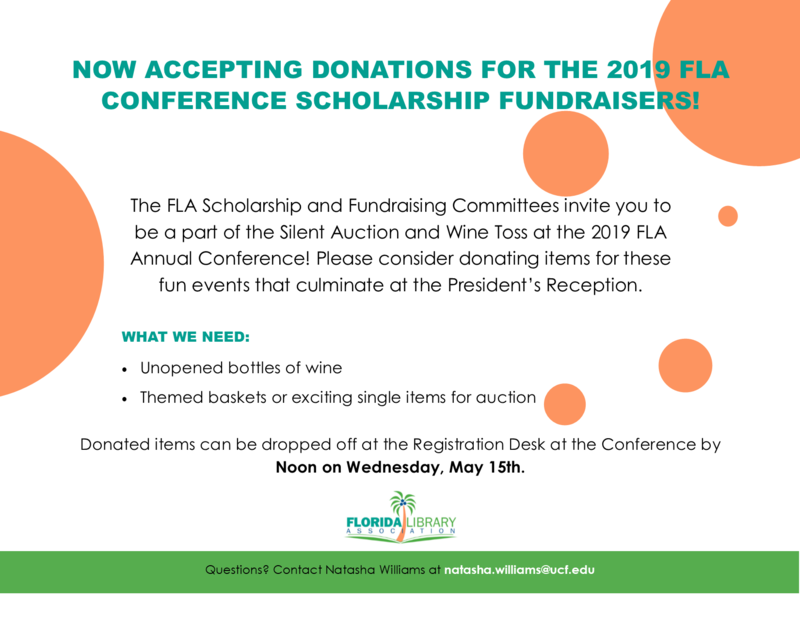 Your donation supports the work of the Florida Library Association, a 501(c)(3) organization. Gifts to FLA are deductible as charitable contributions for federal income tax purposes. A COPY OF THE OFFICIAL REGISTRATION AND FINANCIAL INFORMATION MAY BE OBTAINED FROM THE DIVISION OF CONSUMER SERVICES BY CALLING 800-435-7352 TOLL-FREE WITHIN THE STATE. REGISTRATION DOES NOT IMPLY ENDORSEMENT, APPROVAL, OR RECOMMENDATION BY THE STATE.